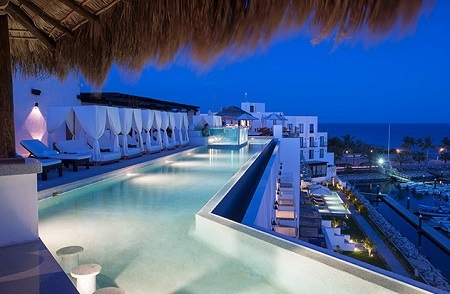 at EL GANZO HOTEL, LOS CABOS RESORT, MEXICO! 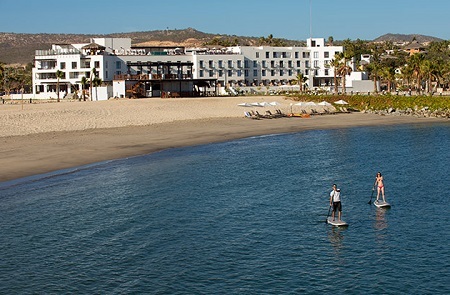 Los Cabos may be one of Mexico’s biggest tourism destinations, but at Hotel El Ganzo Los Cabos, you’ll feel like you’ve arrived someplace special, someplace different. 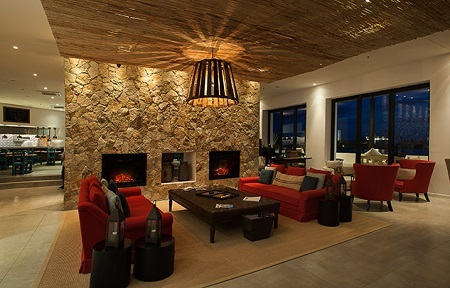 It’s a hotel that prizes creativity, originality and service — not to mention style and comfort. Located less than 20 minutes from San Jose International Airport, Hotel El Ganzo exudes a cool vibe, from the tip of its rooftop sushi bar to the edge of the dramatic infinity pool, and right down into the underground recording studio, where resident artists and visiting performers work their magic. 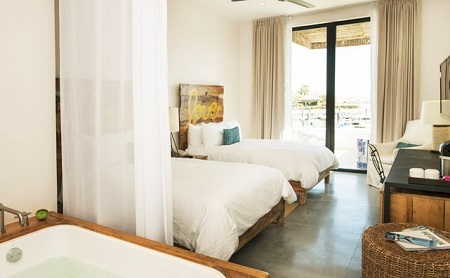 Hotel El Ganzo Los Cabos provides plenty of opportunities for rest, rejuvenation and pampering — but you’ll also be able to indulge as much as you like, with our well-crafted menus of gourmet cuisine and artisan cocktails. We also give you the chance to expand your mind, with a host of curated arts and music programs, where you’ll be able to see live performances and perhaps chat with artists about their work. And its location at the base of the Puerto Los Cabos marina means that you’ll never be far from an array enticing Los Cabos activities. Hotel El Ganzo aims to delight your senses, and taste is a decidedly important one. 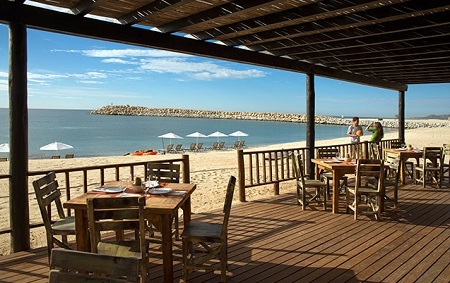 Whether you’re in the main restaurant, on the roof or at the beach, you’ll find lots of delicious choices. With sustainable, farm-to-table cuisine and its own weekly farmer’s market, El Ganzo excels at satisfying. Nothing says “ooh” quite like an infinity pool, and the graceful stretch of water that occupies some 2,013 square feet/187 square meters on our roof is especially alluring. Bali daybeds dot the perimeter, inviting guests to relax and perhaps enjoy a cocktail as they gaze at the beautiful Sea of Cortez. An eclectic music mix — which often includes original work produced at the Underground Studio — helps to set the tone here. After dark, the pool is dramatically illuminated, providing a memorable ambiance for nighttime socializing. 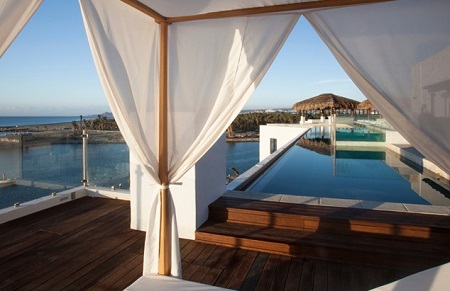 Rustic yet decidedly 21st Century, the Jacuzzi, Balcony and Ocean View suites at El Ganzo combine simplicity and comfort. And with their great locations on three floors, each room has its own beautiful ocean view to enjoy. Each of the Jacuzzi, Balcony and Ocean View suites measure a generous 360 square feet/33 square meters, and are handsomely appointed with design elements like custom-created wood furnishings, crisp white linens and artistic wood headboards decorated with messages of love. You’ll sleep wonderfully. Sliding glass doors lead to open-air terraces, assuring that each room has lots of natural light, not to mention a beautiful view. Within these thee categories, you can choose from a simply beautiful open-air terrace on the water, or perhaps indulge in a Jacuzzi Suite, which has an inviting outdoor Jacuzzi on the terrace — the perfect place to relax and forget about the complications of life. *We cannot request or guarantee placement of standard suite, Jacuzzi, balcony vs oceanview. Stay a minimum of 1 nights or up to 10 nights as desired and based on availability. The hotel charges an additional $25.- resort fee per night which is payable at the resort.